Nice smaller oceanic catamaran, able to accommodate up to 22 people will take you to the short 2 hours long trip around seashore of Southern Tenerife where you’ll enjoy and relax. Moreover, there’s very high possibility to see pilot whales very close to you. 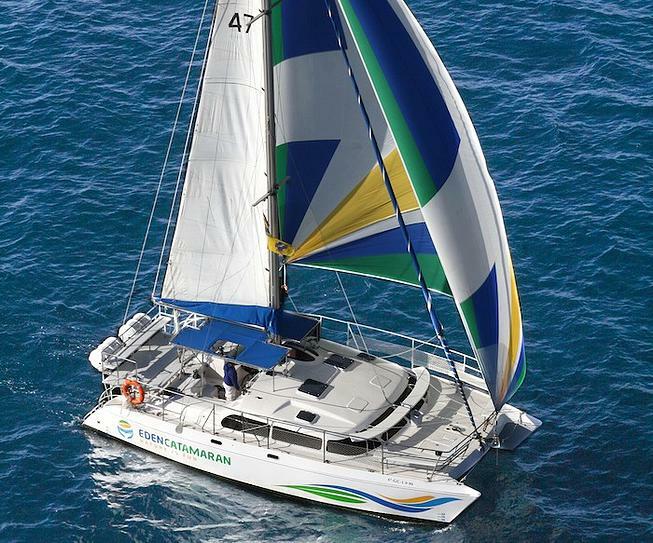 The catamaran could be chartered for you or a group of your friends or families. In order to make your booking of EDEN Catamaran Boat Trips, Private Charters easy and comfortable Tenerife Host use the most advanced and user friendly booking platform TripsPoint.com where you can easily check last actual prices, the tour availability, required booking deposit and book this tour. To get more information of EDEN Catamaran Boat Trips, Private Charters and do booking, please, click the button ‘Book Now’. You will be taken to the tour page at TripsPoint.com where you can easily book the tour. Once the booking of EDEN Catamaran Boat Trips, Private Charters made at TripsPoint you will get your tour Voucher / booking confirmation with all details, including exact pick-up point, pick-up time, pick-up point map. 20€ – per child up to 11 years old. The price including 2 hours sea trip, Whales & Dolphins watching (if you’re lucky), water.